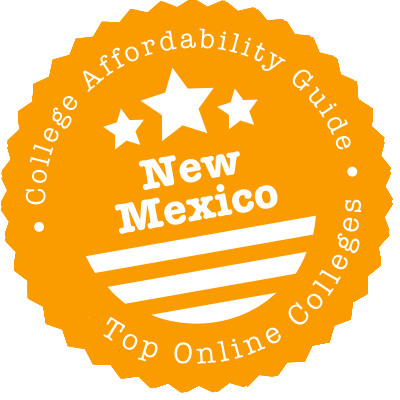 Scroll down to see the top not-for-profit colleges and universities in New Mexico offering online degree programs. Central New Mexico Community College (CNM) is one of just three schools in the state with membership in the Online Learning Consortium, a group dedicated to improving distance education methods. On a personal level, the school's Distance Learning Achievement Coach helps students create and meet academic goals. Students can browse for online and off-campus classes within CNM's catalog, where they'll find hundreds of specialized courses, such as Southwestern Architecture and Anthropology of Drugs, alongside general education fodder like Physics and College Writing. One of the most popular undergraduate degrees at Eastern New Mexico University is a Bachelor of Business Administration, and online students can earn a BBA in a variety of emphasis areas including hospitality management, information systems, or personal financial planning. These business programs are among the 30-plus degrees that can be completed 100 percent online at ENMU. Other online bachelor's include sport management, Spanish, and aviation science. At the graduate level, students can complete an MBA, an advanced degree in education, or a master's in nursing. Students who already have a technical associate degree can complete a Bachelor of Applied Arts and Sciences in nearly 20 concentration areas. New Mexico State University offers everything from bachelor's degrees to doctoral programs through its online learning arm. The eight bachelor's degrees are completion programs for students who have already had two years of college, such as through a community college. Many of the graduate-level programs are in the field of education, including degrees in curriculum and instruction, school administration, and early childhood education. Educators can also earn additional endorsements online. Nurses can pursue a master's, graduate certificate, or doctorate. Other online master's programs include Spanish, public health, engineering, and MBA. NMSU ranked No. 214 in the 2018 U.S. News list of Best Online Bachelor's Programs. One of the unique aspects of WNMU is that, even though it's a four-year university, it bestows associate degrees. Therefore, students in a handful of disciplines, namely business and education (but also the more general liberal studies), receive a diploma after two years. Online offerings are fairly plentiful at the undergraduate level, with a dozen programs (4 of them in education). But there are even more graduate degrees and certificates, which typically relate to the school's strengths in business, criminal justice, education and healthcare. WNMU also lays claim to the only online social work programs in the state accredited by the Council on Social Work Education. Underclassmen can get on that track via the online AA in Human Services. Dona Ana Community College has eight associate degrees and three certificates that can be completed 100 percent online, and the college is working on a way to formalize these offerings. The majority of DACC students are pursuing transfer associate degrees in the liberal arts or business, but the college also has many career technical programs. To assure that online students get a quality education, the college uses Quality Matters, a nationally recognized program that sets quality standards for online coursework. DACC instructors have received training in how to use those standards and online courses are undergoing the Quality Matters course review. Clovis Community College offers online programs in six areas of study, including business, behavioral science, and computer information systems. Students who want to transfer to a four-year school to earn their bachelor's degree can complete an Associate of Arts in Liberal Arts or the Associate of Arts in Early Childhood Education. Some of the online programs can lead right to a job, such as the online Associate of Applied Science in Legal Assistant Studies, which prepares students to work as a paralegal. Classes are delivered in a standard 16-week semester or in eight-week sessions that allow students to take more classes each semester. Business students, educators, and registered nurses will find online programs geared toward their education and career advancement offered online at New Mexico Highlands University. The only undergraduate program available online is an RN to BSN program for registered nurses. Applicants have a choice of taking classes as full-time or part-time students. Full-time students enter the program in the fall, while part-time students can enter in the spring or fall. Highlands also offers an MBA program that students can complete entirely online. The program is accredited by the ACBSP and offers concentrations in accounting, finance, international business, management, management information systems, or human resource management. Three Master of Arts in Education programs are offered online. Those programs are curriculum and instruction, rehabilitation counseling, and special education The M.A. programs require students to complete 36 credits, except for the rehabilitation counseling program, which requires 48 credits. The curriculum and instruction program covers a variety of academic content areas with an emphasis on either elementary or secondary education. USW Online runs business and education degrees. Relating to the former, the Bachelor of Business Administration accommodates 11 specialties, including staples such as Accounting and Marketing as well as rarer concentrations such as Energy Management and E-Commerce. The school's MBA, which is also online, features 11 specializations of its own (although they do not perfectly align with the BBA specializations). As for education, the Master of Science in Education is available in seven different areas that cover counseling, administration, and classroom-based specialties. Graduate students can also seek licensure in Educational Administration or Educational Diagnostics. Plus, the NExT Program admits instructional assistants from the local school district and molds them into certified teachers. Although the Land of Enchantment lacks the sprawling public university systems of its neighbor to the east, it does keep college costs low, making the state an attractive place to study for four years. We’ll tell you which schools offer online degrees, how to graduate early without paying anything, and where you can take distance ed classes in high school. We’ll also inform you of several schools with shaky accreditation status. You’re already one step closer to choosing a New Mexico online college! The New Mexico Higher Education Department is responsible for the state’s four-year universities and community colleges. While you’ll occasionally find online degrees at one of the latter, such as Clovis Community College, the best place to look is a four-year university. Six of the seven state-run universities — Eastern New Mexico University, New Mexico Highlands University, New Mexico Institute of Mining & Technology, New Mexico State University, University of New Mexico and Western New Mexico University — hand out distance education degrees. The best way to save money on college in New Mexico is to start in high school. Why? Through the state’s Dual Credit program, all New Mexico secondary schoolers can take classes from public colleges and earn high school and college credit simultaneously. Even better, New Mexico law mandates that public colleges must waive tuition and that local education agencies — public school districts, charter schools or Bureau of Indian Education (BIE) schools — must cover textbooks. You’re just responsible for fees, which vary by institution, and are sometimes waived altogether. Talk to your school administrator to see if you qualify. So, what courses can you take? It all depends on where you’re enrolled in high school, as each district or school crafts its own agreement with individual colleges. Many of the classes are online. Find a complete list of approved courses at the New Mexico Public Education Department website. There’s no limit to the amount of courses you can enroll in, so it’s possible to finish a year of college before you even arrive! New Mexico may not have the distance education program you’re looking for. But if you’re from there, it would be a shame to miss out on some of the cheapest in-state tuition rates in the country, wouldn’t it? WICHE’s Western Undergraduate Exchange (WUE) lets you attend participating colleges in 14 Western states while paying no more than 150% of that school’s resident tuition. The Western Regional Graduate Program (WRGP), meanwhile, brings tuition down all the way to the resident rate, but there are fewer qualifying programs. Want into New Mexico? WUE and WGRP go both ways. Twelve New Mexico public colleges charge students from WICHE states the reduced rate. The Higher Learning Commission (HLC) is the regional accreditor for New Mexico. It lists all the institutions it accredits on its website. If your school is on the list, it means you are eligible for federal financial aid and should be able to transfer credits between institutions. On the HLC page for New Mexico, scan for any “Public Disclosure Notices,” which indicate the Commission has reprimanded a school. A notice is, often, a minor issue; probation means the school has run afoul of Commission standards; and show-cause means the school’s continued accreditation status is in serious doubt. New Mexico colleges have the option of seeking national accreditation instead. Students at such schools still qualify for financial aid, but their credits probably won’t transfer to HLC-accredited institutions. The Council for Higher Education Accreditation’s (CHEA) database maintains a searchable list of all accredited schools in the U.S.
American Century University, which advertises online programs, does not mention its accreditation status on its website. That’s because it’s not accredited. It isn’t in the CHEA database or on College Scorecard, and you won’t qualify for federal or state aid to attend. Carrington College is a for-profit chain based out of California. It’s accredited in good standing by the Accrediting Commission for Community and Junior Colleges, a regional accreditor for California and several Pacific islands. Before enrolling at Carrington, however, you should know that in 2016 the Federal Trade Commission sued its parent company, DeVry Education Group, for deceptive marketing practices related to its DeVry University wing. The group settled the lawsuit for $100 million. HLC placed New Mexico Highlands University, which offers several online degrees, on probation in 2016 because the university was out of compliance in areas “related to staffing and institutional support, assessment of student learning, student retention and completion rates, governance, and institutional planning.” New Mexico Highlands remains accredited while on probation and will work to comply with HLC standards. Read HLC’s public disclosure notice here. Trinity Southwest, which runs online degree programs, is not accredited. Therefore, it isn’t in the CHEA database or on College Scorecard, and you won’t qualify for federal or state aid to attend. Higher Learning Commission (HLC): New Mexico’s primary accreditor lists all institutions under its wing and, via its website, notifies the public of any negative actions it takes against a school. New Mexico Public Education Department: This government office website shows you which free courses high schoolers can take for college credit. Look through the FAQs to find more information about the state’s Dual Credit program, including costs, locations and eligibility criteria. Western Interstate Commission for Higher Education (WICHE): Though not originally designed for distance education, undergrads and graduates can certainly use WICHE’s tuition reciprocity programs to lower the cost of online tuition at colleges throughout the western U.S.